Swami Anantananda, teacher for The Power of Recognition: Kundalini Shakti, is a student of Gurumayi Chidvilasananda. He is the author of the Siddha Yoga book What’s on My Mind: Becoming Inspired with New Perception which focuses on understanding the workings of the mind in day-to-day life. The book is based on a series of talks Swamiji gave at Gurumayi’s request in 1994. Swami Anantananda was also author of the earlier home study course, Living Siddha Yoga Wisdom. In conjunction with that course, he traveled widely, giving workshops for course students. 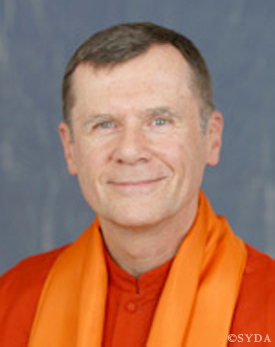 One of the foremost teachers of Siddha Yoga meditation, Swamiji has offered numerous Siddha Yoga retreats and workshops and was for many years in charge of trainings offered to long-term retreat participants at Shree Muktananda Ashram. Swamiji has been practicing Siddha Yoga meditation since 1976, when he received shaktipat from Baba Muktananda. Before becoming a monk in 1980, he taught biology at a college in Michigan. Swamiji holds a Ph.D. in plant ecology.